Norman Parkinson was born in London (birth name Ronald William Parkinson Smith). He began his career in photography in 1931 as an apprentice to the Bond Street Court Photographer Richard Speaight. In 1934, he set up the Norman Parkinson studio with Norman Kibblewhite at One Dover Street, specialising in portraiture. His first solo exhibition was staged in 1935 and included portraits of Vivien Leigh and Noel Coward. In the same year, he was recruited by Harper’s Bazaar to take editorial photographs. During the Second World War, Parkinson served as a reconnaissance photographer over France for the Royal Air Force. Parkinson embarked on a long assosciation with British Vogue in 1942, becoming one of the magazine’s star photographers. From 1960 to 1964, he was an Associate Contributing Editor of Queen magazine. In the 1960s, he began taking official portraits for the British Royal Family. He was elected Honorary Fellow of the Royal Photographic Society and was appointed CBE in 1981. In the same year, a major retrospective of his work was held at the National Portrait Gallery, marking his fiftieth year in photography. Parkinson continued to work as a freelance photographer until his death in 1990, while on assignment in Singapore. Throughout his long career, Parkinson charmed his sitters with his idiosyncratic persona and sophisticated, witty style and he is remembered today as one of fathers of modern fashion photography. 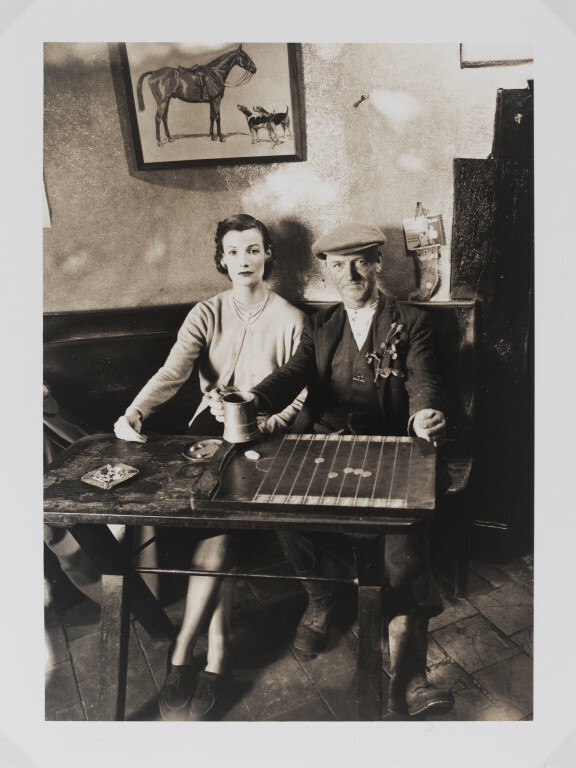 In this post-war image, his wife and muse poses immaculately beside a cowman in a ﬂat cap. A traditional game of shove ha’penny is in play on the table in front of them. The original caption in British Vogue read, 'Well Mannered Quality: Wenda Parkinson wears a hand-knitted cashmere twinset by Women’s Home Industries. The Public Bar, Hobnails Inn, Little Washbourne, Gloucestershire'. Photograph depicting an elegant woman sitting at a table next to a man wearing a flat cap. The man is holding a tankard and a game is set out on the table before them. There is a framed picture of a horse on the wall behind them. Parkinson’s sophisticated and witty approach brought him success for five decades. 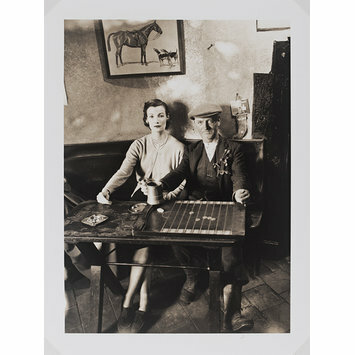 In this post-war image, his wife and muse poses immaculately beside a cowman in a ﬂat cap. A traditional game of shove ha’penny is in play on the table in front of them.